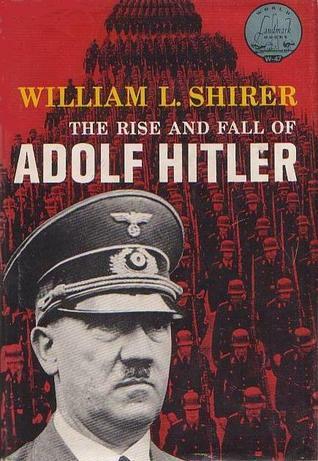 In 1960, William L. Shirer published “The Rise and Fall of The Third Reich.” The tome was over 1200-pages long, and based on numerous sources, including Nazi officials’ journals, Nuremberg Trial records, various intelligence reports, and—perhaps most importantly—on the author’s firsthand observations as a CBS journalist covering these events. The book sold millions of copies in the U.S., and even more worldwide. Owing to the important subject matter, as well as the world’s obvious curiosity about World War 2, Shirer was commissioned to write a version aimed at younger readers. “The Rise and Fall of Adolf Hitler” was originally published in 1961. Here, it is published in e-book form for the Kindle Reader Age to access. This book indeed uses language a younger reader can follow. It doesn’t skimp on facts, nor does it talk-down to its audience. Shirer’s book covers the basics of Hitler’s life, as well as his infamous rise to power and eventual death. To condense this entire story into an easy-to-read text must have been daunting, but William Shirer does an excellent job. We see Hitler as an aimless child in Austria. We follow his rejection from the Arts University he wanted to attend, and subsequent life as essentially a tramp. We follow him into service during World War 1, where he served bravely and with valor, and his disgust with the weakened Germany dictated by the Treaty of Versailles. He found a small group who shared his views, and he quickly rose to lead it, eventually changing its name to what we know as The Nazi Party. From there, the story covers events familiar to anyone who’s studied WW2 Germany: the Beer Hall Putsch, taking over of the Reichstag, assumption of absolute power. Next came the land grabs, as Hitler took over Austria, the Sudetenland, and formed his non-aggression pact with USSR Dictator, Josef Stalin. Hitler’s war went amazingly well in the beginning, and then it fell apart under his megalomaniacal leadership. Shirer’s writing is matter-of-fact and clear; it is accessible to young readers as well as adults. The Nazis were notorious for their record-keeping and documentation. It is very easy for an author to dig deeply into this wellspring of inside information and pound the reader insensate with numbers and dates. William Shirer understood his mission with this brief history: present the basics in accessible language, and be done. This is not a scholarly work, nor should it be. Shirer’s triumph is condensing a hugely complex, historically imperative story down to the basics. He does this admirably. “The Rise and Fall of Adolf Hitler” works perfectly to introduce younger readers to this horrific yet relevant period in our world’s history, or to provide a primer for adults who feel daunted by the longer historical accounts. Either way, Adolf Hitler and his notorious legacy are preserved here for anyone. This entry was posted in Books, History, Non Fiction and/or Commentary, Young Adult. Bookmark the permalink. By younger, what age do you mean? Obviously not pre-schoolers (you can’t illustrate the Third Reich with primary colors and rhyming), but how young? Middle school and up, probably. It’s no more difficult than “The Hobbit,” though far less fantasy-making (hopefully). I read “Rise and Fall of The Third Reich” for a class at FSU, and it was unwieldy: 1280 pages, and full of so much information. This is the basic story. E.g. it talks about Goebbels, but doesn’t go into his PhD and how he was a failed writer. I read it in two hours or thereabouts, stopping a few times for mandatory cat petting.